A commenter suggested I take a look at Points per Play, so that’s what I’m doing today. Note that I haven’t fully thought this through, so I’m going light on the analysis until I feel comfortable with the real meaning behind the data. 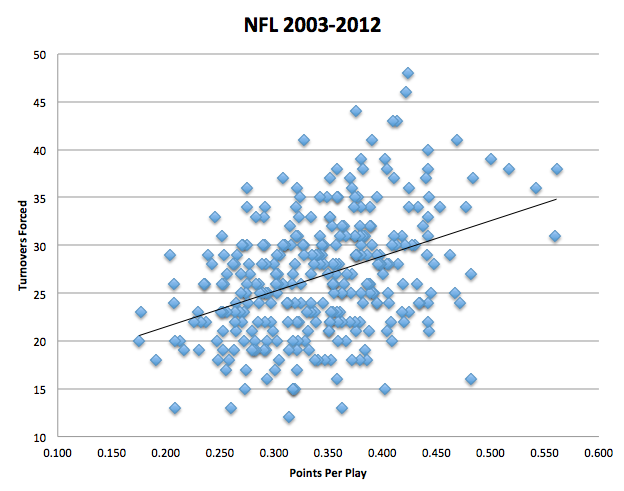 For starters, here are the highest points per play measures from the last ten years. I should also note here that my data is different from the points/play and points/game data from teamrankings.com, and I haven’t yet figured out why. For now, I’m going with mine, since I know how that was compiled, just know that there may be some small discrepancies (definitely some rounding differences). As a reminder, Red highlighting means a team LOST the Super Bowl, Yellow means it Won, and the Eagles are in Green. 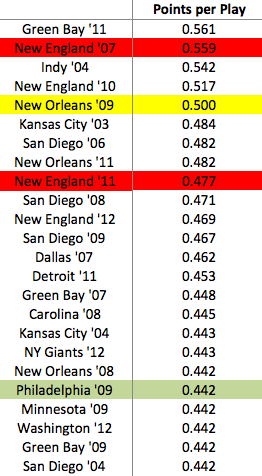 Somewhat surprisingly, the 2007 Patriots do not rank #1, though a .559 mark is amazing. Green Bay’s 2011 team sets the mark for offensive efficiency, in terms of maximizing the scoring impact of each play. Regarding the Eagles, the 2009 team sets the mark for the Andy Reid Era, though the 2010 team was not far behind (.425). Remember, both the 2009 and 2010 teams were 25% better than league average on offense. The defense, on both teams, performed worse (+2%, -7%). Is a high points per play measure good? Obviously, it is. However, the question I want to raise here is if the goal on offense should be two-fold. Scoring points is, by far, the priority goal. Given the choice, though, shouldn’t teams want to run a lot of plays? In theory, running more plays takes more time off of the clock, meaning the opposing team’s offense gets less time on the field. Commentators also frequently cite the fatigue impact of keeping the opposing defense on the field, but I don’t see a big advantage there, since presumably the offensive players get tired too (and don’t rotate like the defenders do). It’s interesting that just 2 teams in the table above even reached the Super Bowl, with just 1 winning it. The correlation value is -.24. So teams that score efficiently, despite presumably giving the ball back to the other team fairly often, do not appear to allow more points as a result. Perhaps scoring so efficiently puts a lot of pressure on the other team to keep up. Therefore, despite receiving a lot of possessions, the other team is forced to make higher risk plays, leading to more negative plays, and potentially more turnovers. Let’s take a look. 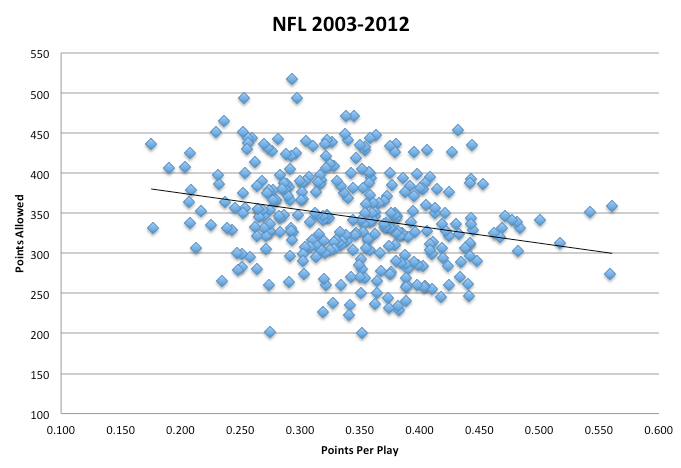 Here is the chart showing Points Per Play against Turnovers Created. Bingo. The correlation value is a fairly strong .38. UPDATE: There are definitely some causation issues here (i.e. forcing turnovers helps teams to score with fewer plays). However, given the other offensive data I looked at, I feel comfortable saying it runs more in the direction cited above then in the reverse. Just know that there is a kind of positive feedback loop at work here. This goes a long way to explaining the apparent discrepancy I discussed above. Teams that score frequently also give the opposing team a lot of possessions. However, those opposing teams do not score more often as a result. The reason (or A reason, at least), is that the opposing teams end up turning the ball over as they try to keep up. This goes back to a post I did way back in January about team’s Pass Play Percentage. The gist of that post was that teams may alter their game-plans too early when losing. Even down by 2 touchdowns, teams should not abandon the run game until well into the 4th quarter. By passing more to keep up, losing teams force themselves to successfully execute a strategy they’re not prepared for against a defense that is expecting pass. The result, predictably, is a lot of turnovers, which obviously hurts the comeback effort. That brings up the whole concept of Game Theory in run/pass selection, which I think is an extremely fertile area for NFL analytics and research. Can’t address it in any more detail today though, so we’ll stop there. Lastly, Happy Independence Day. I’m probably taking the rest of the week off since I won’t be near my computer much anyway. Enjoy. Could it be that teamrankins.com have excluded kneel downs? Possibly. Unfortunately, they dont have any footnotes or explanations (that I could find), so we’re left to guess for now. Thanks. I love that last chart. Much to ruminate on over the holidays. Happy 4th!